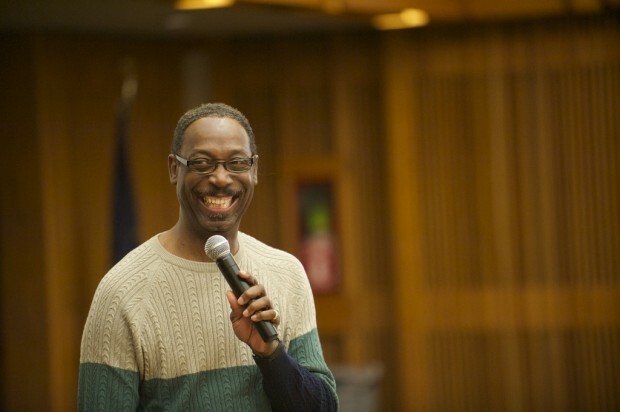 On April 25, Salt Lake Community College took part in the first annual African and African American High School Day Conference, offering high school students from various districts a morning of inspiring speeches, workshops and information concerning their college future. “One of my biggest goals and my main focus as a multi-cultural advisor is the students,” says Glory Johnson-Stanton, Academic and Career Advisor at SLCC and Club Advisor for the Black Student Union (BSU). A dream envisioned six years ago, the conference was organized by Johnson-Stanton with intent to give advice and guidance to high school students, helping them make the choices necessary for success. Research studies in Utah have shown that African Americans are the minority, with most never attending college, let alone graduating. Highlights of the conference came from several guest speakers, including SLCC Dean of Students Dr. Marlin Clark, 2010 SLCC graduate Makafui Danhounsrou and high school district representatives. When it came time for workshops, high school boys and girls were divided into groups, each discussing leadership and self-image. The segments included discussions that gave students the opportunity to participate and have their perceptions on certain topics heard, free from judgment. There were over 100 high school students in attendance at the conference. Support came from BSU, Academic and Career Advising, Student Life and Leadership and the office of Dean of Students. For more information on how to get involved, BSU meets Thursdays at noon in room 221 of the Student Center at Taylorsville Redwood Campus. High school students from across the state attended the African and African-American High School Day Conference on April 25. 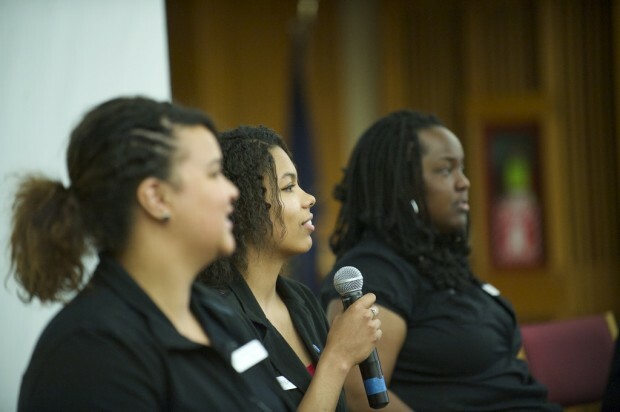 Black Student Union members Victoria Howell (left) Tashelle Wright and Glory Shekinah Stanton (right) speak during the African and African-American High School Day Conference on April 25. 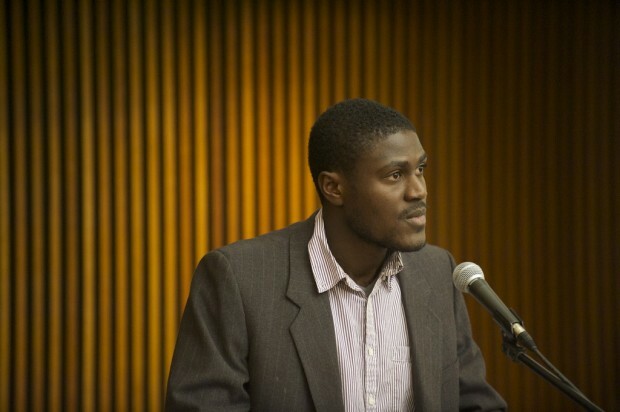 Guest speaker Makafui Danhounsrou talks to high school students during the African and African-American High School Day Conference on April 25. Salt Lake Community College hosted the African and African-American High School Day Conference on April 25. 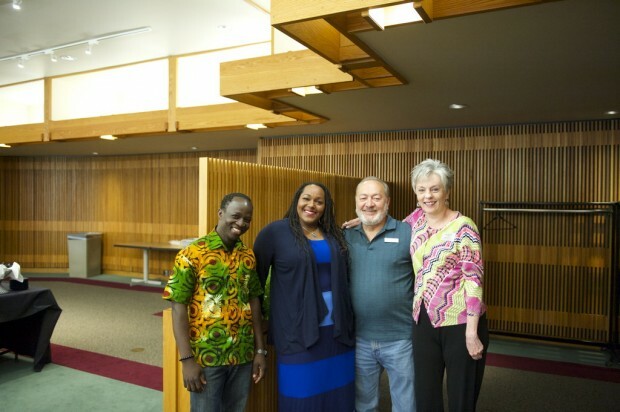 Pictured: Dr. Abio Ayeliya (left), Glory Johnson-Stanton (2nd from left) and Jill Kemerer (right).